We provide technically advanced Synchronous Digital Controllers in domestic as well as global markets. 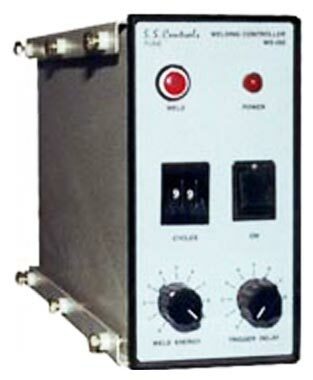 The Automatic Digital Controller of Synchronous is widely used for manually operated simple Resistance Spot Welders. It can also replace simple timer contactor configuration of the welding machines. These kinds of Synchronous Digital Controllers are available with easy to easy to read thumbwheel switches for setting number of weld cycles. In addition to this, the company is regarded as one of the leading Synchronous Digital Vlsi Controllers Exporters in India. Compact user friendly low cost controller. Precise time & energy control ensures consistent weld quality. Easy to read thumbwheel switches for setting number of weld cycles. Output : Gate-Cathode drive signal to drive a pair of back to back thyristors of any capacity. Built in back to back thyristors ( 95A Max). Weld Time : 0-99 cycles ( Â½ cycle of I/P supply frequency). Weld Energy : 0-100% adjustable by potentiometer. Trigger : External N/O contact. Actuates on contact closure. Trigger Delay : 0.1 sec - 3 sec, adjustable by potentiometer. Manually operated simple Resistance Spot Welders. Can be used as a perfect Product for Upgradation of existing spot welders. Replaces Simple Timer Contactor Configuration.